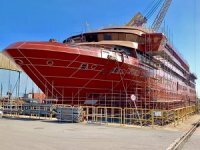 Carnival Cruise Line announced Thursday the first steel was cut for the company’s newest class of ship and the new livery was revealed for the 180,000-ton XL vessel that will be the first-ever ship operating in North America to use LNG. 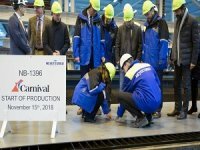 The steel-cutting ceremony was held at the Meyer Turku shipyard in Turku, Finland, where the new red, white and blue hull design that celebrates Carnival’s legacy as America’s cruise line was unveiled. 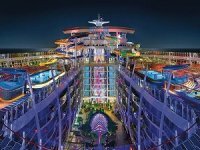 The construction of the largest Carnival cruise ship ever planned will be completed and delivered in 2020, with a second XL ship starting construction in 2020 and expected to be delivered in 2022 to mark the 50th anniversary of Carnival’s founding. 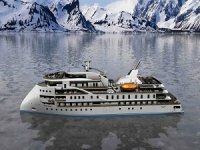 “This new ship promises to be truly special, from its groundbreaking technology and one-of-a-kind features to its distinctive livery and hull design that is both timeless and forward-thinking while paying tribute to our nearly 50-year history of making wonderful vacation memories for our guests,” Carnival president Christine Duffy said in a statement. 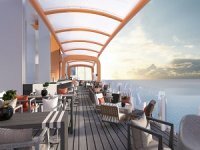 Once the steel-cutting ceremony was over, construction began on the 5,200-plus lower berth ship that will operate from Port Canaveral, Florida, beginning in 2020. 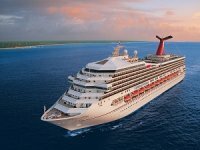 The vessel still has not received an official name, but Carnival officials said it will be revealed in early December. Details on the ship’s inaugural season are planned to be announced in January.